Following it’s major showing at the South Bank Centre The Southall Story Exhibition moved to the Dominion Centre in Southall in May 2011. The Southall Story celebrates a vibrant British suburb and aims to create a broader awareness of its diversity and global cultural significance. The Southall Story created by Shakila Maan, Kuljit Bhamra and Ammy Phull with Cathy Woolley and Michael McMillan is finally coming together. Southall is re-created with a sense of a ‘Time Tunnel’ where we go back to the 1950’s and explore an extraordinary history, both cultural and political. Southall is a town that has welcomed new communities throughout the last century, enabling them to excel and influence both the social and political structures of Britain. Just had an amazing meeting at the Royal Festival Hall with the person in charge of the exhibition space (called The Spirit Level). 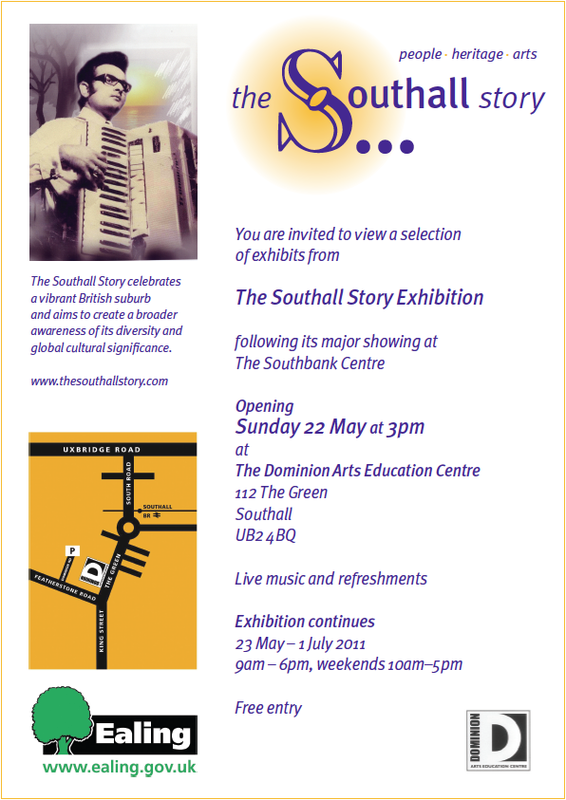 The Southall Story will have an exhibition there for a month commencing 6th April 2010 – come to the launch party that evening! (More details to follow soon under News & Events). Our proposal is to create a ‘time tunnel journey’ – we wish visitors to be able to walk through and experience the Southall decades starting 1950 to the present. As you walk through a series of living rooms, you will notice how fashion, communications and living styles have changed over the past 70 years. Archive photographs showing famous landmarks and various other images will be on display, and you will even be able to record your own story in a recording booth! During the launch weekend (6-11 April) various guest stars and artists will perform impromptu sets..we hope to have Mohinder Kaur Bhamra (female bhangra pioneer), Premi & Heera alongside other well known celebrities including Gurinder Chadha…very exciting!! The London community of Southall has made a phenomenal but under acknowledged contribution to UK music, arts and politics. By the mid 1970s its record shops became not only source of a fabulous range of South Asian music but also key social gathering places. The riots of 1979 released a new freedom and confidence among young Brit Asians and encouraged the flowering of Bhangra: a musical fusion that spread from the corner shops to massive international popularity. A screening of For the Record: the social life of Indian vinyl in Southall (Dir, Kuldip Powar 2008) is followed by an insightful and inspiring celebrity discussion chaired by composer/producer Kuljit Bhamra, exploring the story of Southall through its remarkable musical history. Plus a foyer exhibition of photographs, Indian musical instruments and bookstalls.